With its unique Aquabio technology, Freudenberg Filtration Technologies can energy-efficiently and economically clean wastewater to make it usable again, whether in a dairy operation or a Scottish whiskey distillery. This is good for the environment because it lowers drinking water consumption and the quantity of wastewater. And it is good for the operators because they significantly lower their costs for fresh water and wastewater disposal. 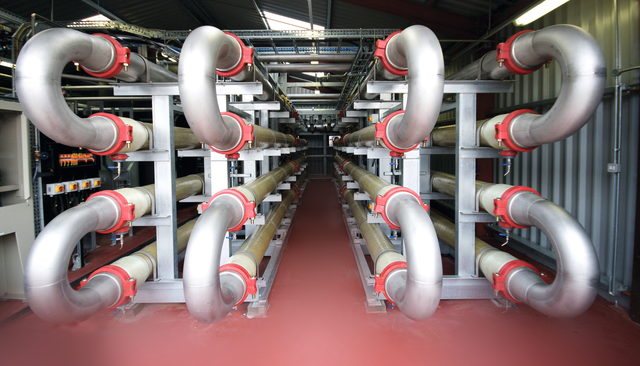 Under the brand Viledon Water Solutions, Freudenberg offers complete system solutions, including planning and construction. The core of this advanced wastewater treatment technology consists of aerobic membrane bioreactors with unparalleled energy- and cost-efficiency. Of course, the systems cannot turn water into wine. But they can also treat industrial wastewater to enable its further use in the production process, such as for cooling purposes. The systems are fully automated. Additional advantages include real-time remote monitoring and control. With downstream reverse osmosis and an additional disinfection stage, it is even possible to achieve potable water quality, if desired. Especially sustainable and resource-friendly: upstream anaerobic water treatment. Here, the biogas resulting from the decomposition of organic substances is utilized to generate energy, eliminating dependence on fossil fuels.